Oiluwadee designs and handcrafts this beautiful pair of earrings. 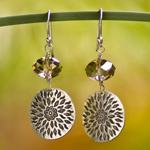 She hangs facetted glass beads and silver discs from sterling silver hooks. 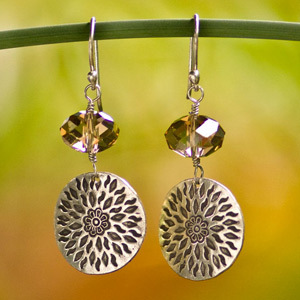 The discs are cut, engraved and stamped by hill-tribe jewelry artisans. This item may vary slightly in colors, weight and size. Natural stone - slight variations and small defects in the stones are to be expected. Materials: Glass and sterling silver (.925). This piece of jewelry is designed and crafted by Oil Yuwadee. She was born in Chiang Rai province and now lives in Chiang Mai. 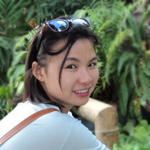 "As a Thai woman living in a rural area of Chiang Mai, I am happy with what I create and will be happy if you like it too. My handmade jewelry comes from my love and the love of those who help support me. I hope you like it," says Oil. ... Read Oil's biography on Ezistock Blog.